When a detection algorithm determines that a deadlock exists, several alternatives are available. One possibility is to inform the operator that a deadlock has occurred and to let the operator deal with the deadlock manually. Another possibility is to let the system recover from the deadlock automatically. There are two options for breaking a deadlock. One is simply to abort one or more processes to break the circular wait. The other is to preempt some resources from one or more of the deadlocked processes. To eliminate deadlocks by aborting a process, we use one of two methods. In both methods, the system reclaims all resources allocated to the terminated processes. » Abort all deadlocked processes. This method clearly will break the deadlock cycle, but at great expense; the deadlocked processes may have computed for a long time, and the results of these partial computations must be discarded and probably will have to be recomputed later. 1. Selecting a victim. Which resources and which processes are to be preempted? As in process termination, we must determine the order of preemption to minimize cost. Cost factors may include such parameters as the number of resources a deadlocked process is holding and the amount of time the process has thus far consumed during its execution. 2. Rollback. 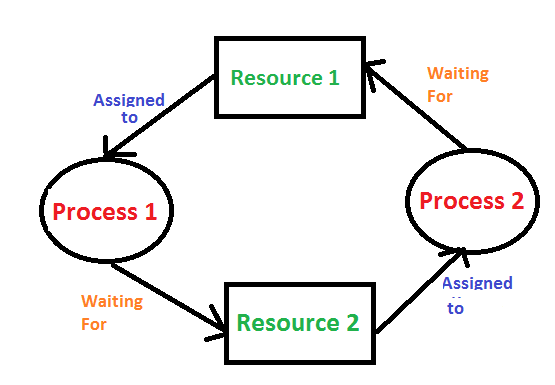 If we preempt a resource from a process, what should be done with that process? Clearly, it cannot continue with its normal execution; it is missing some needed resource. We must roll back the process to some safe state and restart it from that state. Since, in general, it is difficult to determine what a safe state is, the simplest solution is a total rollback: Abort the process and then restart it. Although it is more effective to roll back the process only as far as necessary to break the deadlock, this method requires the system to keep more information about the state of all running processes. 3. Starvation. How do we ensure that starvation will not occur? That is, how can we guarantee that resources will not always be preempted from the same process? In a system where victim selection is based primarily on cost factors, it may happen that the same process is always picked as a victim. As a result, this process never completes its designated task, a starvation situation that must be dealt with in any practical system. Clearly, we must ensure that a process can be picked as a victim only a (small) finite number of times. The most common solution is to include the number of rollbacks in the cost factor.